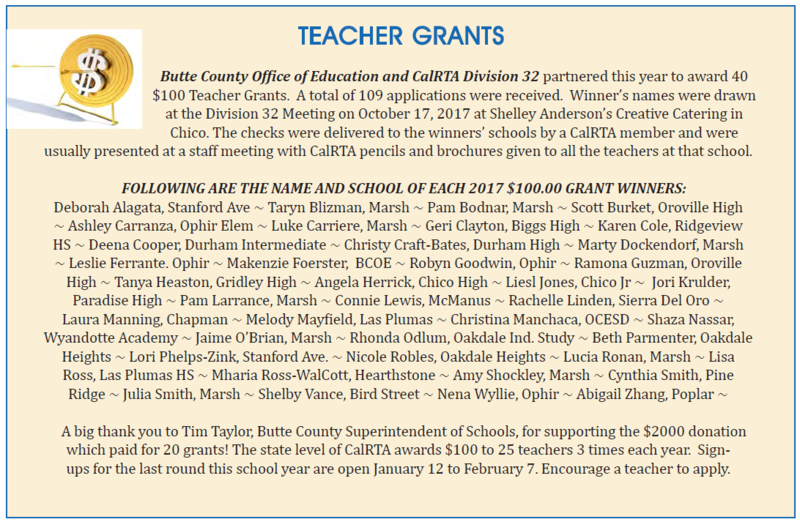 Butte County Office of Education and CalRTA Division 32 partnered this year to award 40 $100 Teacher Grants. A total of 109 applications were received. Winner’s names were drawn at the Division 32 Meeting on October 17, 2017 at Shelley Anderson’s Creative Catering in Chico. The checks were delivered to the winners’ schools by a CalRTA member and were usually presented at a staff meeting with CalRTA pencils and brochures given to all the teachers at that school. A big thank you to Tim Taylor, Butte County Superintendent of Schools, for supporting the $2000 donation which paid for 20 grants! The state level of CalRTA awards $100 to 25 teachers 3 times each year. Sign-ups for the last round this school year are open January 12 to February 7. Encourage a teacher to apply. Click this link to read the entire CalRTA winter newsletter.